Jul et Mad’s final chapter in their evolving love story is called Amour de Palazzo. I say evolving because I sure am hoping that they will continue in this vein. Romance and love drew me to this brand and knowing that Julien and Madalina (Jul et Mad) are together only brings hope that their love story will continue with more perfume launches. Amour de Palazzo was created by Dorothée Piot and includes notes of Four Spice (pepper, cloves, ginger, nutmeg), absolute of violette, Atlas cedarwood, leather, Indonesian patchouli, labdanum, musk, oud, amber, papyrus and animal castoreum. The story behind the perfume is where the two have fallen in love and are on a trip together in Venice. They are discovering the back streets of the city after having danced the night away at a Palazzo. They are free to love and to cherish each other and the moment they are sharing. The perfume opens up quite sharp with a good dose of pepper and cloves. Thankfully the pepper soon dissipates and gives way to the other spices. My amateur nose wants to say that there is a tad of cinnamon as well, but that could be the four spices intertwining. These spices mistakenly give me the impression that the perfume will become sweeter and more gourmand all around. The spices are indicative of the spark between two lovers. Love is ignited with a small spark and if we are lucky love can become our little piece of heaven on earth. After the spicy opening, the perfume quickly evolves into a leather and wood accord for me. 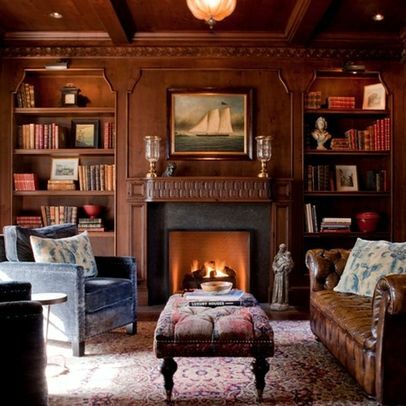 The picture I get is of an old estate with a Sherlock Holmes type leather (Chesterfield) couch placed in front of a fire-place in the library filled with leather-bound books. This is the type of couch which draws people to it and invites them to sit in front of a crackling fire to talk and reminisce and yes touch. The oud is softened by the amber and the musk. It is so well rounded that all I can do is keep my nose to my wrist. Oud is certainly not a prominent note. It is a soft woody leather that is perfect for day and night. This is very much a sensual perfume – begging your loved one to come and bury their nose into your neck. The amber sweetens it slightly, but not overly so as it is definitely a unisex perfume. This leather couch has beckoned both my husband and myself. Our love has grown to the point where two kindred spirits are intertwined as one. One harmonious couple able to take on the problems that come with life. It is such a comforting perfume – one that invokes cashmere shawls and fire places with pristine views. It becomes my fortress. It becomes my sanctuary. Nothing can go wrong, nothing can come between us and nothing can destroy our love. Love smolders, just like the fire in our fireplace. This entry was posted in Amber, Fragrance Reviews, Jul Et Mad and tagged Amber, Fragrance, Jul et Mad, Perfume, Review. Bookmark the permalink. Sandra, what a beautiful review for a beautiful perfume! Amour de Palazzo is my favorite in the trio. Thanks Undina. This one is also turning out to be my favorite. The dry down is so beautiful. It sounds very intriguing indeed……. It definitely is intriguing. It transported me to another world an left me there for hours. Bliss! All three are beautiful. I hope their distribution gets wider and that you will have the opportunity to try them soon. Please let us know what you think of the perfume when you get your hands on it. It sounds lovely, but I’m not particularly moved by “amber oud”. There’ve been far too many releases playing around those notes. I wonder what the next trend in perfumery will be! I also was not too keen in another oud inclusive perfume. I really do not get that much oud and it is such a comforting perfume that it surprised me. I hope there won’t be a trend – just well done beautiful perfumes across the board. i am a sucker for romance and you have done a fantastic job reviewing these three perfumes! Loved it! And out of all the places I visited in Italy Venice was by far my favorite….not surprised that love blossomed in that magical city! Hope to see more of these from you :D!!! Thank you Brie for the very kind words. I too am a sucker for romance as you can tell. I still have to go to Venice and am sure that I will fall in love with the city. The perfume sounds lovely but honestly I’d like to just curl up in front of that fireplace and take a nap. Oh, this sounds beautiful. “Soft woody leather” sums up my favourite perfume style perfectly. And I happen to be in Venice at this very moment! Wouldn’t it be wonderful to sniff this while I’m here. Unfortunately, while I’ve visited a few great perfume shops here, I’m pretty sure none of them carried this line. I’ll have to add it to my next sample order! How lucky you are! Have a fabulous time in Venice and I hope you like this perfume once you get to try it. Sandra, your writing is so enticing! Sounds like a perfume for kicking off your shoes and snuggling up with, as well as for wandering the back streets of Venice.. Thank you Tara. Now I just need to get lost in Venice. Thank you for this trio of evocative reviews. I feel this one would be most likely to be my favourite of the three perfumes, though I might just wait for a spell of cold weather or even the autumn to come before trying it! I do agree with you The Perfumed Dandy – this perfume will definitely be even more comforting in autumn or winter. Although I must add that it really smolders on a warm day and in a delicious way at that. Ines, I think you will really enjoy this one. I just love reading your reviews, this one is especially wonderful. And the perfume sounds like a slice of heaven. Sandra, I loved reading all three of your reviews for the Jul et Mad perfumes because your writing about them really shows me who you are. Your romantic streak is so deep and strong!! I received my samples of all three perfumes last week and I think I need to spend more time with them. I’m very impressed by the fact that they have complex compositions that slowly unfold on the skin, but for some reason, I only fell in love with them at the far drydown stage (and that went for all three of them oddly enough). But I had a very busy week in which I had to travel out of town and back for various family celebrations, so perhaps I was too distracted. 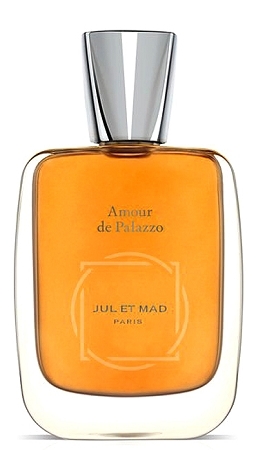 Of the three, Amour de Palazzo was my favorite – and though I can’t say I detected much oud, I got a very beautful cedar accord from it that smelled like a cedar chest (and the delicate clothing stored within such a chest).